The first in a series of four illustrated guides identifying aquatic and standing water plants in the central Midwest, this convenient reference volume covers the 183 species of Cyperaceae. Robert H. Mohlenbrock includes three types of plants: sub-mergents, those that spend their entire lives with their vegetative parts either completely submerged or at least floating on the water's surface; emergents, which are typically rooted underwater with their vegetative parts standing out of water; and a third category of plants that live most of their lives out of water but that live in water at least three months a year. 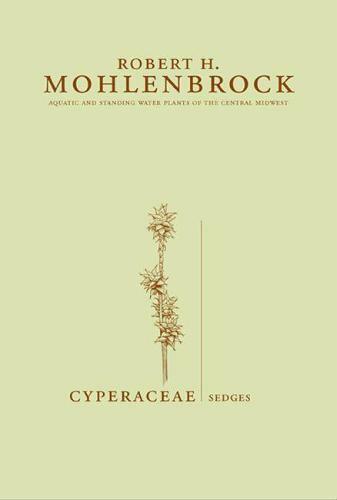 Mohlenbrock provides descriptions, illustrations, and ways to identify any plant in the sedge family (Cyperaceae) in the states of Kentucky (except for the Cumberland region), Ohio, Indiana, Illinois, Iowa, Missouri, Kansas, and Nebraska. With taxa arranged alphabetically, the volume is well organized and easy to use. In addition, basic synonymy, description, distribution, comments, and line drawings that show the habitats and distinguishing features for each plant. Habitat and nomenclatural notes are also listed, as are the official wetland designations given by the U.S. Fish and Wildlife Service.